“I’ve kind of decided, but I’ll make it public on Sunday,” Bowles said in a display of gamesmanship. “He looks good,” Bowles said without providing details. Darnold said Wednesday his foot was feeling “a little sore,” but had no pain and was “hopeful” he’d be ready to play against the Titans. McCown is ready to play either way. His right hand was cut when he banged it on a helmet during the Jets’ loss last Sunday to New England. Davis Webb has served as his backup the last two games while Darnold has been sidelined. 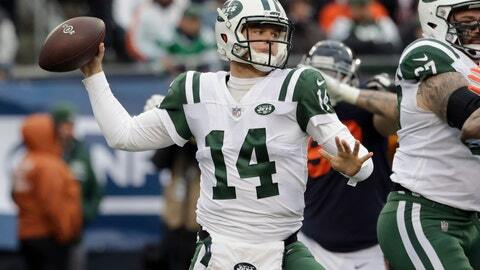 Depending on whether Darnold returns this weekend or next Sunday at Buffalo, he’ll have four or five games to try to finish his rookie season on a positive note. He still leads the NFL with 14 interceptions despite missing two games, and his 55.0 completion percentage and 68.3 quarterback rating rank at or near the bottom of the league. — Safety Marcus Maye was ruled out for the second straight game because of shoulder and thumb injuries. Bowles said “it’s possible” Maye could have surgery on his shoulder and the team will “soon” make a decision on his status for the rest of the season. Cornerback Darryl Roberts is expected to fill Maye’s spot again after starting at safety against New England. — Wide receiver Robby Anderson is questionable with an ankle injury that has been bothering him the last few weeks. He was injured against Minnesota in Week 7 and missed two of the next three games, but played last week against New England and had two catches for 22 yards. “We’ll warm him up beforehand (at Tennessee) and see how he feels,” Bowles said. — Running back Trenton Cannon (hamstring) and wide receiver/kick returner Andre Roberts (foot) were full participants at practice after being limited Thursday.